We’d love your help. 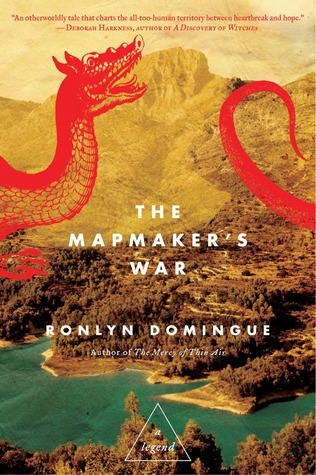 Let us know what’s wrong with this preview of The Mapmaker's War by Ronlyn Domingue. This will be the map of your heart, old woman. In an ancient time, in a faraway land, a young woman named Aoife is allowed a rare apprenticeship to become her kingdom's mapmaker, tasked with charting the entire domain. Traveling beyond its borders, she finds a secretive people who live in peace, among great wealth. They claim to protect a mythic treasure, one connected to This will be the map of your heart, old woman. In an ancient time, in a faraway land, a young woman named Aoife is allowed a rare apprenticeship to become her kingdom's mapmaker, tasked with charting the entire domain. Traveling beyond its borders, she finds a secretive people who live in peace, among great wealth. They claim to protect a mythic treasure, one connected to the creation of the world. When Aoife reports their existence to her kingdom, the community is targeted as a threat. Attempting to warn them of imminent danger, Aoife is exiled for treason and finds refuge among the very people who had been declared her enemy. With them, she begins a new life surrounded by kindness, equality, and cooperation. But within herself, Aoife has no peace. She cannot share the grief she feels for the home and children she left behind. She cannot bear the warrior scars of the man she comes to love. And when she gives birth to their gifted daughter, Aoife cannot avoid what the child forces her to confront about her past and its truth. On this most important of journeys, there is no map to guide her. In this tale, her autobiography; Aoife reveals her pain and joy, and ultimately her transformation. To ask other readers questions about The Mapmaker's War, please sign up. You can't help but think that the second person narration somewhat ruined a good idea. You aren't so sure that you would be willing to take on the sequels. You are sorry to say it but there it is. The Mapmaker’s War reads like a blend of William Morris, Ursula K. LeGuin, and Jeanette Wi I hate bloated epic fantasy with a white-hot hatred that could blind the baby Jesus, and the fact that your standard fantasy novel nowadays is 500+ pages of grimdark neckbeardio “world building” only makes my blood boil. So when this book crossed my radar, likely via amazon algorithm, the first thing I did was check out the page count. It was less than 300 pages. That was enough to make me want to read it. The Mapmaker’s War reads like a blend of William Morris, Ursula K. LeGuin, and Jeanette Winterson mixing social allegory and utopian yearnings with keen-edged, descriptive prose. Fantasy fans deeply embedded in the genre will likely view the book with suspicion, since it’s “literary” in unacceptable ways: 2nd person narrator, unconventional dialogue tags, and lots of summary. Don’t be one of those people. Give it a read. It’s refreshing to read a secondary world fantasy novel completely orthogonal to the genre. [3 Stars] This is yet another book I'm finding difficult to rate. I really enjoyed it, but there are certain characteristics this book has that makes me pause. I'm going to talk about what I liked first though, and that has to be the overall storytelling and the world Domingue has created. It's magical but at the same time isn't. I like the way this book really does feel like a memoir written by a woman who has been through so much in her life, has been a catalyst for so much without really want [3 Stars] This is yet another book I'm finding difficult to rate. I really enjoyed it, but there are certain characteristics this book has that makes me pause. I'm going to talk about what I liked first though, and that has to be the overall storytelling and the world Domingue has created. It's magical but at the same time isn't. I like the way this book really does feel like a memoir written by a woman who has been through so much in her life, has been a catalyst for so much without really wanting it. I also loved how honest our main character was. You felt for her, her plight, and you also felt her grow. It really is a bit of a magical book. Now I'm going to talk about the things that cannot make me give this book higher than a 3.5 star rating. First up we have the writing. Yes, the writing is well done, lyrical, beautiful even. The fact that this is written in second person only adds to the intrigue. I liked the writing but often I found it distracting. There are no quotations in this book, and we move from one plot point to the next so quickly that I found myself more wanting to skim the story than actually read every sentence. I also felt that the writing was a bit wispy. It left me wanting more detail, but that is probably just my own preference for description. The other things that threw me off were the violence and the sexual abuse in this book. I wasn't expecting either, but there they were. These elements seemed to be added to increase drama in the story, to emphasize how females in our main character's world are kind of at the mercy of men. I felt like that point was clear without having the sexual abuse, it seemed like overkill to me. It was highly disturbing, and I just don't know how I feel about it apart from that I don't think it was necessary. I also want to add that this story definitely had its boring moments, and I don't really know how I feel about the end. I know it is a story about our main character, her growth. But at the end of the day I don't know if I can call her story happy, sad, triumphant, or anything really. I just don't know what to think of it. "Until love and peace are constant, our purpose is not fulfilled." 3 or 4? I'm debating. A death brought me to tears, but I had a real problem with the second person narration. It seemed discordant. This is also book one in a trilogy, but it seems to have such a finite ending, in not sure where this storyline could go? Aoife grows from young tomboy, to royal mapmaker, to reigning princess until war and greed disrupts the peace of the kingdom. A near Utopian society is its victim, too weak to defe "Until love and peace are constant, our purpose is not fulfilled." This was an extremely strangely written story for me as I had never read anything written in second person narrative before. 'Thank you, but I'll wait to eat them. Stained fingers, stained map, you said. Adding to the confusing way of writing was the complete lack of quotation marks which I have seen more and more of in literature these days and still am not clear as to why this is done. I dislike it greatly. Unfortunately, the story didn't benefit from This was an extremely strangely written story for me as I had never read anything written in second person narrative before. Adding to the confusing way of writing was the complete lack of quotation marks which I have seen more and more of in literature these days and still am not clear as to why this is done. I dislike it greatly. Unfortunately, the story didn't benefit from these choices in writing styles; it actually diminished my interest because it was a constant struggle trying to grasp what was being said. Every now and again, I read a book that reminds me why I love reading. The Mapmaker’s War: A Legend by Ronlyn Domingue is one such novel. Domingue weaves a tale of love, ambition, loneliness and belonging that will resonate within all of us. Aoife (pronounced ee-fah) is the mapmaker in this story. Born a girl in a far away land in a time long ago, her path in life was set: grow up, marry, and produce children. Instead, at a young age she falls in love with charts and maps. A childhood friend, who Every now and again, I read a book that reminds me why I love reading. The Mapmaker’s War: A Legend by Ronlyn Domingue is one such novel. Domingue weaves a tale of love, ambition, loneliness and belonging that will resonate within all of us. Aoife (pronounced ee-fah) is the mapmaker in this story. Born a girl in a far away land in a time long ago, her path in life was set: grow up, marry, and produce children. Instead, at a young age she falls in love with charts and maps. A childhood friend, who also happens to be the crown prince, learns of her desire. Pretty soon, she is apprenticed to the kingdom’s mapmaker. Aoife enjoys the freedom and privilege not common to girls her age. In her travels to map the kingdom’s land, she discovers another land. Word spreads of the Guardians’ gold paths and various riches, and soon Aoife’s kingdom is ready for war. She attempts to advocate for the Guardians’ peaceful, almost Utopian world, but to no avail. Aoifee is eventually exiled and adopted into the Guardians’ community. While her new community is understanding and embraces her, Aoife struggles with her past, her betrayal, and her inner demons. Wow, did that sound like I gave away the entire story? Don’t worry, there are no spoilers. The book jacket reveals even more details. The beauty in this story is Aoife’s evolution, transformation even. I loved it! I believe Ronlyn has a cross over hit on her hands when this hits the shelves. In addition, to being a middle school librarian I read a lot of young adult literature. I couldn't put this book down and knew when I finished it I would read it again. The characters are strong and the message powerful. I can definitely say that I haven't read any other books like this before. It took me a while to decide if that was a good thing or a bad thing. This book is written in a way that is at times captivating, but at other times, on the verge of being so repetitive that it might drive you crazy. I haven't read very many books that use second person narrative to navigate the telling of the story. I'm still not completely sure how I felt about it. On the one hand, it was unusual and that added points i I can definitely say that I haven't read any other books like this before. It took me a while to decide if that was a good thing or a bad thing. This book is written in a way that is at times captivating, but at other times, on the verge of being so repetitive that it might drive you crazy. I haven't read very many books that use second person narrative to navigate the telling of the story. I'm still not completely sure how I felt about it. On the one hand, it was unusual and that added points in the originality category. On the other hand, listening to the same usage of "you did.... and then you were..." actually got in the way of the storytelling for me personally. I felt like I was listening to someone tell me my own story, and to be honest, at some points it rather irked me. This would have been a difficult viewpoint to write any book from, and under those circumstances, I think this author handled the task better than I would have expected from anyone. The title may be slightly misleading as the book is not actually about war at all, unless you refine the word to the simplest sense possible and consider it more of a psychological term. The character is at war with their own thoughts and emotions. I finally decided to leave this book four stars because although I'm not sure how much the viewpoint will work for everyone, or even how well it worked for me, this was a striking novel. Some of the passages are written so beautifully that you wish you could quote them for the world to hear and the idea behind the story was amazing, although I am not positive I loved the execution as much as I had hoped. I truly feel this is one of those books that will have to be left up to individual interpretation. In the end, it became a novel that I will remember for a long time, and I believe that it will stand out in the mind of other readers as well. This was a 3.5 Star read for me. I enjoyed this enchanting once-upon-a-time tale exploring identity, choice, and power with a feminist bent. Even as a child Aoife was able to skirt around the expected female roles of her society. Using her father’s position and her friendship with the prince – she secured a coveted mapmaker’s apprenticeship position - allowing her the freedom to roam and map uncharted territories. It is her discovery of a secretive society with mythical wealth and a magical drago This was a 3.5 Star read for me. I enjoyed this enchanting once-upon-a-time tale exploring identity, choice, and power with a feminist bent. Even as a child Aoife was able to skirt around the expected female roles of her society. Using her father’s position and her friendship with the prince – she secured a coveted mapmaker’s apprenticeship position - allowing her the freedom to roam and map uncharted territories. It is her discovery of a secretive society with mythical wealth and a magical dragon that reveals the greed of her kingdom, and the life altering decision that will haunt her until a second chance at motherhood assuages her guilt. The second-person narrative and the even tone pulled me into the story along with the gorgeous prose so it felt like an old-fashioned bedtime read where you eagerly went to bed to read the next installment. Captivating compelling characters, good storytelling, and issues of forgiveness and compassion makes for a satisfying read. Ronlyn Domingue's The Mapmaker's War is one of the best literary fantasy novels I've ever read. It differs greatly from other novels and it's one of those novels that can be recommended to both mainstream readers and speculative fiction readers. It belongs to the small group of novels that can be called literary treasures. What makes The Mapmaker's War an extraordinary novel is that it's written entirely in the second-person narrative mode. This is rare, becau Originally published at Risingshadow. What makes The Mapmaker's War an extraordinary novel is that it's written entirely in the second-person narrative mode. This is rare, because most authors avoid using this narrative mode. This mode works well in this novel and it creates a mythic atmosphere. Reading a novel that has been in this narrative mode may be a bit challenging for readers, but once you get into the story, it's difficult to stop reading it. When the story grabs hold of you, you'll find yourself turning pages as fast as possible to find out what happens to the protagonist. The Mapmaker's War is a beautiful and touching story about Aoife, her life, her work and the choices she makes. It's possible to say that this novel is Aoife's memoir. Aoife is a fascinating and complex character, because her life isn't easy. She experiences both happy and sad moments in her life, and feels trapped by her marriage etc. The author writes beautifully and touchingly about Aoife's choices and how she learns to live with what she's done and accepts what's happening to her. What makes Aoife an interesting character is that she's ahead of her time, because she wants to be a different kind of a woman than just a dutiful wife and mother who takes care of the children. She wants to continue her work and travel (she's rebellious and doesn't want to settle down). As Aoife travels from one place to another, the readers get to know what kind of a woman she is. Aoife tries to find inner peace and harmony, because what she has done and what has happened to her continues to torment her. Aoife's life changes in many ways during the course of the story. When she's still a mapmaker, she's a totally different kind of a woman than after her exile. She continues to evolve with new circumstances and re-learns to do things. Reading about her choices and relationships with different people is captivating. I'm sure that all readers will be fascinated by Aoife's search for peace, love, forgiveness and redemption. There's plenty of depth in this novel. The author writes about such issues as love, forgiveness, redemption, compassion and non-violence in a deep and touching way. She explores them through Aoife's life and feelings. Reading about the culture of the Guardians was fascinating for me, because their culture was based on compassion and equality. They were a non-violent people who valued a peaceful way of life. Their way of life differed from the way of life that Aoife was used to, because her own people were the ones that started the war. The author has a fluent way of writing about what kind of brutality men are capable of doing to each other. For example, reading about Leit and his past was fascinating. Leit's story was touching and unforgettable in its raw brutality. It was interesting to read about Wei, because she was born to be a Voice. Her abilities made her different from her family and other people, because she saw the world with different eyes and was sensitive to people's emotions. The author wrote fascinatingly about her abilities and her training. I think that several readers will be interested in finding out what happens to Wei and how her powers develop. I have to mention that the author wrote well about Makha (a wolf), because she was an important creature for Leit. I've always enjoyed reading about animals in fantasy novels, so it was nice to read about Makha. When I read this novel, I noticed that it was almost like a fairy-tale for adults. If the author would've chosen, it might have been possible to add the words "once upon a time..." to the beginning of the story. There's a charmingly allegorical and parable feel to the story, and the author has an ability to make the reader think about the happenings. Ronlyn Domingue is a talented author, who writes beautiful and almost poetic prose. She's one of those authors whose prose both charms and touches the hearts of the readers. She outshines several other authors and manages to create a charmingly mythic atmosphere with her gently flowing prose. In my opinion the contents of this novel and Ronlyn Domingue's writing style reminds me of Guy Gavriel Kay's novels, Ursula K. Le Guin's novels and J. M. McDermott's Last Dragon. It's almost like an original and unique combination of their writing styles and storytelling talents. I think that readers who love Ursula K. Le Guin's stories and novels will enjoy reading this novel. Because I loved this novel, I'm eagerly awaiting its sequel, The Chronicle of Secret Riven, which will be published in May 2014. I'm also thinking of reading the author's debut novel, The Mercy of Thin Air (Atria Books, 2005), because it seems to be an interesting novel. I can highly recommend The Mapmaker's War to readers who love literary prose and captivating stories. I sincerely hope that several readers will read this beatifully written novel and spread word about it to other readers, because it's a unique fantasy novel. If you've ever read literary fantasy novels or literary historical novels and liked them, you must read The Mapmaker's War, because it's a brightly sparkling gem of excellent prose and beautiful storytelling (in terms of depth, prose and storytelling it's a memorable work of art). This novel will resonate with the readers long after the last page has been read. This was a very interesting read, but it's not for the unsophisticated Fantasy-beach-book audience. I read so many Fantasy manuscripts these days that I rarely pull a published Fantasy novel off the shelf to read for my own pleasure. (Something like 50 of them mock me from the Unread Shelves as I type this.) By "rarely" I mean once every 18 months, or so. This isn't even one I bought on my own: it was a freebie from a World Fantasy or Nebula Weekend attendee's bag. I gave it the First Page Test w This was a very interesting read, but it's not for the unsophisticated Fantasy-beach-book audience. I read so many Fantasy manuscripts these days that I rarely pull a published Fantasy novel off the shelf to read for my own pleasure. (Something like 50 of them mock me from the Unread Shelves as I type this.) By "rarely" I mean once every 18 months, or so. This isn't even one I bought on my own: it was a freebie from a World Fantasy or Nebula Weekend attendee's bag. I gave it the First Page Test when I sorted the books after the con, which it passed, and I distributed the losers to the little free libraries that have sprung up all over the East End. There's yet another trick to the prose, which is an artful use of a medieval phrasing that can easily go terribly wrong. If you read the Icelandic sagas, or the Medieval Romances and histories, you'll often see sentences that come to complete stops. Full assertion, stop. Full assertion, stop. This slows the reader down, and in its bad form I've labeled it The Stomp. It can create paragraphs with zero flow, and little logical gaps between the sentences. Domingue manages to make it contemplative, and she doesn't do it in every paragraph. This gives a Fantasy feel, like somebody actually writing a memoir with a quill pen, without depending on forsoothly phrasing. It's kinda brilliant. But yes, it does slow the reader down. This is engrossing, but the pages turn a little slowly. And many readers (as you can see from the wide range of ratings) simply can't deal with the unfamiliar POV and prose style. I found the tale worth the risk, and was especially pleased that the book takes up subjects that Fantasy so often ignores, like the damage that warfare does to the warrior; and the damage they bring home. (Fantasy has strong roots in the Greek mythology and the Athenian Tragedies, which simply bathed in that material.) The work is a Fantasy Utopia, in a way, which seriously considers the duties of Utopian communities to the rest of the world. My one quibble is that, like most Utopias, it essentially ignores the mentally ill and the fundamentally depraved or sociopathic citizens. It does take on the hideously wounded and abused, though. Five stars for that alone, I say. It is also -- students take note -- grimace-free. This book endeavors to tell a new legend, weaving together an imagined history that could also be a possible future, giving us a glimpse of Utopia that has become very rare in our Dystopian times. The ending left me breathless and anticipating the next book! When my copy of The Mapmaker's War A Legend arrived, the first thing that caught my eye was the beauty of the book itself. The cover has a textured feel to it and the art is lovely, the pages have a torn look to the edges. The book is written as if it was translated from an ancient language of a different time and place, hence the choppy, fragmented prose. I found myself having to become acclimated with this style of writing in order to enjoy the storyline. There are small drawings sparsely plac When my copy of The Mapmaker's War A Legend arrived, the first thing that caught my eye was the beauty of the book itself. The cover has a textured feel to it and the art is lovely, the pages have a torn look to the edges. The book is written as if it was translated from an ancient language of a different time and place, hence the choppy, fragmented prose. I found myself having to become acclimated with this style of writing in order to enjoy the storyline. There are small drawings sparsely placed throughout the book, which added to the story's effect. The book is told in the first person narrative by a woman named Aoife who becomes her kingdom's mapmaker. The novel revolves around her life's journey, both physical and emotional. This is a coming of age story for Aoife as she goes from being a young girl, to a wife and a mother. She is an old woman as she looks back on life and narrates her tale. This is definitely the kind of writing that can draw you in and envelop you or bore you to pieces. I found the start of a the book to be a bit slow, but the middle gained its momentum and after about page ninety, I could not put the book down. I am very glad I stuck with it because the end, I loved this book. Aoife is a dynamic character, she is complex in many ways and I found myself immersed in her story. As a young girl she goes on to travel her kingdom's domain with others and jots down the territories. She has a wanderlust and she loves traveling and mapmaking and the freedom that comes with that line of work. When Aoife returns home, she finds herself pregnant by a Prince and winds up hastily marrying him. Marriage and motherhood are things she never wanted, yet here Aoife finds herself with a chance to be Queen someday. On one of her trips, Aoife discovers a group of people who hide a mythical creature, a dragon. These people live by a code of peace. When her own community tries to make her give the exact location of the group so they can wage war against them, she refuses. Aoife is exiled for treason. Without giving too much away, Aoife soon finds herself in between two worlds, the life she once knew and the new one she is just coming into. Author Ronlyn Domingue presents this story and its characters in a unique way. There's a magical realism to the story and as I read, I never quite knew what to expect. I also enjoyed that there is love within the storyline. It is a deep and unexpected love where the two people really understand each other. I recommend The Mapmaker's War A Legend for readers who enjoy prose that is expressive and artistic and if you enjoy reading books that require your full attention. Despite the slow start, I enjoyed this richly told novel and am glad I discovered it. I look forward to reading the sequel, The Chronicle of Secret Riven which is due for release in 2014. Once upon a time…how many times in the past does a reader enter a tale where a person battles evil and wins peace and happiness for a very long time? Despite the stark realities that age imposes about how much goodness and evil humans can foster, a part of us subconsciously dares to dream of a Utopian existence, a Shangri-La, a fantasy yes but all the more sweeter for the dream! Aoife is our heroine in this wonderful tale. Although girls and women have their affixed roles in the home, Aoife is al Once upon a time…how many times in the past does a reader enter a tale where a person battles evil and wins peace and happiness for a very long time? Despite the stark realities that age imposes about how much goodness and evil humans can foster, a part of us subconsciously dares to dream of a Utopian existence, a Shangri-La, a fantasy yes but all the more sweeter for the dream! Aoife is our heroine in this wonderful tale. Although girls and women have their affixed roles in the home, Aoife is allowed to develop her significant skills as a mapmaker. First she charts the local area and then after being mentored and trained travels afar, loving her unique job and yet always aware that her good fortune exists because of the gracious will of her King. Her life is about to undergo a whirlwind change when she inadvertently comes upon a magic village where a dragon and people with special powers live. A huge treasure pile stuns her and she quickly realizes what other greedy people would do for such a bounty. What most impresses her, however, is the sense of total peace these people emanate and she absorbs. Her desire to stay is intense but she knows her duty. The challenge in this tale as in all stories of real life is the fall Aoife experiences when her lover, Prince Wyl, becomes King and allows his brother to twist his mind regarding the land Aoife found. This will cause a horrendous war that brings unbearable suffering to the members of the peaceful town, especially their Warriors. Because Aoife has told her King about this land and mapped the way to its borders, she feels responsible; remapping with a deceptive path changes little. She will suffer dire consequences, leave and return to that other place for the rest of her life where she will come to understand how gifted these people are, trained to handle all that would poison a healthy and whole lifestyle, and establish oh so loving relationships that will delight the reader. She will re-learn what it is to be a fully present wife, mother and community member in a fully-functioning cooperative society. The Mapmaker's War is a book like no other book I have ever read. It creates a world far removed from the one in which we all exist, taking the reader on a journey of confusion, discovery, magic and love. I am not sure I completely understood it. I know I need to read it again - maybe another time after that - to fully grasp the author's intent. I know like most literary novels a lot of it happened somewhere over my head but I do know that I was enthralled for my time within its pages. The book i The Mapmaker's War is a book like no other book I have ever read. It creates a world far removed from the one in which we all exist, taking the reader on a journey of confusion, discovery, magic and love. I am not sure I completely understood it. I know I need to read it again - maybe another time after that - to fully grasp the author's intent. I know like most literary novels a lot of it happened somewhere over my head but I do know that I was enthralled for my time within its pages. The book is written in the second person which did take a bit of getting used to - it does tend to keep the reader at a bit of a remove. There are also no quotation marks; this being a new conceit in books. Why? Don't ask me but it was easy enough to sort out when characters were speaking. It didn't distract from the reading - at least not for me. This is not going to be a book for everyone. I suspect that a few years ago it would not have been a book for me but having stretched my reading choices over the last couple of years I have opened my mind to less literal books and have been rewarded with gems like this. I'm finding it hard to articulate exactly was I was so enthralled; the writing was engaging. I loved the main character of Aoife even though she was, at times, not likable at all. She was, if nothing else very, very human. I find myself thinking about Aoife and her worlds. She lived in two but really only felt at home in one of them. She is like many of us in that way. In trying to protect where she felt safe and protected she opened it up to a horror it never should have known. I won this novel in the Goodreads Giveaway contest, it is the first I've ever won. I got the Advance Uncorrected Proofs-Not For Sale softcover version Courtesy of Simon & Shuster Canada. I loved this book, but (and I know everything said after a "but" is invalid) ...but :-) it is definately a chick-lit* book. OK, I do have to admit that I do have a soft-spot for this kind of writing, the story i I won this novel in the Goodreads Giveaway contest, it is the first I've ever won. OK, I do have to admit that I do have a soft-spot for this kind of writing, the story is told thru, and by, the book's lead character, so I could get how some girls and women would more easily identify with her. I had no problems reading it, but I know many of my manly-men-friends who would put it down after a few pages in. However, being a ladies' man ;-), myself... this is a great conversation piece if you know the lady you're talking too has also read it. Still, it is an excellent piece of fantasy-fiction. We rarely see "medieval"-fantasy written from a woman's point of view with such sensitivity and care. The main character is human and has ner flaws. But flawed characters are always much more interesting than the perfect ones. My congratulations to Ronlyn Domingue (the writer), I think she's got a winner here and I will be passing my copy along to my lady-friends. ...maybe after I've read it a second time. I don't think I would ever have purchased this book as I knew nothing of the writer or her previous book. But, now that I've read it, I will probably be on the lookout for the sequel and buy it when comes out. I simply couldn't finish this book. I tried, I really did. I wanted to like it so much. I loved Domingue's first book, The Mercy of Thin Air, but this one did nothing for me. First of all, the writing style really put me off. The book is written in second person stream-of-consciousness point of view. It drove me absolutely mad. It was as though the narrator is telling the story to herself. "You did this, you did that". It was exhausting to read. Also, there are no quotation marks used for dialog I simply couldn't finish this book. I tried, I really did. I wanted to like it so much. I loved Domingue's first book, The Mercy of Thin Air, but this one did nothing for me. First of all, the writing style really put me off. The book is written in second person stream-of-consciousness point of view. It drove me absolutely mad. It was as though the narrator is telling the story to herself. "You did this, you did that". It was exhausting to read. Also, there are no quotation marks used for dialogue and the sentence and punctuation structure was often odd. It make the book difficult to follow. I only made it about 80 pages in, so maybe the story would've gotten better, but in what I read, very little happened. At the beginning of the book, I though there would be a love story between Aoife and Wyl but then she very quickly loses interest in him. She gets pregnant with his babies and seems to become repulsed by him and the idea of childbirth and marriage. At first, I was all for her wanting to stay unmarried and free and her fear of being tied down. I understood her desire to be rid of the babies she never wanted because she felt trapt. Then it just went on too long. After the twins are born she never seems to name them or have any interest in their well-being. The longer it went on, the more unlikeable Aiofe became. It's hard to care for a narrator that is more concerned with a village of people she has visited once than her own offspring. I finally decided to just give up. Ronlyn Domingue's latest novel, The Mapmaker's War: A Legend is an ambitious literary novel that more easily slides into the canon of magic realism than it does commercial fantasy. Generally an epic tale of a woman who defies convention and national obligation, the story explores issues of equality not only of the sexes, but of cultures, of governments founded on imperialism at the expense of all integrity, versus the cost of pacifism. Brilliantly told from second person, present tense, Domingue Ronlyn Domingue's latest novel, The Mapmaker's War: A Legend is an ambitious literary novel that more easily slides into the canon of magic realism than it does commercial fantasy. Generally an epic tale of a woman who defies convention and national obligation, the story explores issues of equality not only of the sexes, but of cultures, of governments founded on imperialism at the expense of all integrity, versus the cost of pacifism. Brilliantly told from second person, present tense, Domingue's handling of this difficult voice is immediate, brilliant and compelling. At no point is dialogue written, rather it's told, and again demonstrates the author's skill in being able to take what could have been an extremely narrator-intrusive, action-stopping technique, and instead has rendered a story of imperatives. The story itself is, as all timeless stories, driven by relationships and the characters behind those relationships, and in this case both are three dimensional and believable. In tone I was very much minded of some of Ursula K. LeGuin and Candas Jane Dorsey's works, in particular Always Coming Home and Black Wine respectively. I have never read anything by this a Aoife is a mapmaker. At the request of the king, she and a small crew are sent to investigate the rest of the land and chart it on a map. During this expedition, Aoife meets a village of people. They show her their land which includes great wealth of gold. When the king learns of this village he dispatches a group to check it out. Aoife warns the people and in turn makes herself a traitor to her own people. She is exiled. This is where Aoife’s journey begins. It was like I was Aoife. So as I was reading this book, it made it more interactive as if I could reach out and touch the dirt, smell the rain, and even fall in love. Ms. Domingue is a very prolific writer. I really do not know how else to describe this book. I am pretty much speechless in a good way. The Mapmaker’s War is priceless treasure! This is a book that you will not share but having your friends purchase their own copies. Domingue’s second novel is of the rarest of all kinds. A unique story, written in a striking narrative, telling an original story. The Mapmaker’s War was unlike anything I had ever read before. The story is told by the main protagonist in first person narrative –something that took a while to get used to. The story is about a young woman named Aoife who is tasked with mapping the kingdom. In the process of making maps, she soon travels beyond the borders of her lands and finds a colony of people living in great wealth and steady peace. On her return she soon learns that her very own people see the settlement as a threat and soon war is tearing the kingdoms apart. It is now that Aoife must decide where she stands and how far she is willing to go to protect the people she loves –in both kingdoms. Domingue manages to achive the rare pleasure of taking the reader on a journey. Even though the story is set in a land far away, a world so very different to ours, on more that just a few occasions did I wonder how I would have acted, what my decisions would have been and if I would have had the strength to fight the way Aoife did. The writing is lovely and atmospheric. I like how everything came around full circle at the end. The 2nd pov choice for narration is distracting and hard to get into at first but it grew on me. Maybe I could have connected better if the author had used another style to write in, maybe not, but it was a nice book. Short and sweet. Amazing! Another woman who can write and who tackles the conflicts inherent in being female with wisdom as well as a wry humor. The mapmaker is female and defies conventional roles for women. In her young years she manages to get pregnant by the Prince of her kingdom, impress him enough to get him to marry her, and unwittingly start a war between her kingdom and a peaceful neighboring people. She pays dearly for her adventurous ways and lives a conflicted life. In this book, the first of a trilo Amazing! Another woman who can write and who tackles the conflicts inherent in being female with wisdom as well as a wry humor. The mapmaker is female and defies conventional roles for women. In her young years she manages to get pregnant by the Prince of her kingdom, impress him enough to get him to marry her, and unwittingly start a war between her kingdom and a peaceful neighboring people. She pays dearly for her adventurous ways and lives a conflicted life. In this book, the first of a trilogy, she looks back over her life from the vantage point of an old woman. Despite loss and sorrow, she does not regret her past but only seeks to understand how she ended up with the life she has. Though the book must be labeled fantasy, it is so much more. The time span gives it the feel of historical fiction and the intrigues provide plenty of adventure. Running beneath all this, like an underground river, is the clear intelligence of Ronlyn Domingue whose perception of humanity, male or female, old or young, is visionary. I know that sounds over the top but I have no other explanation for the impact The Mapmaker's War had on me. This book is not for grumpy cynics or doomsayers, it is not for those who prefer the status quo and believe in puritanical, patriarchal, warlike societies. It is for dreamers of what mankind could be, believers in magic, kindness, equality, cooperation, and a joyful sensuality. The main character, Aoife (which I strangely learned to pronounce by watching E! 's reality tv show, Chasing the Saturdays, about the British girl band - hah), is fascinating. "The Mapmaker's War" was a very interesting story to me. I liked the story itself. There is a little bit of fantasy and a little bit in this book that really drew me in and kept me reading until the last page. This story is definitely very inventive and will be perfect for readers who want their fantasy reading to be unique. THE MAPMAKER’S WAR:A LEGEND BY Ronlyn Domingue is an interesting Fantasy/Myths/Folk Tales set in an Ancient time,in a land far away. This was a difficult book for me to read, but with that said it also was an interesting read once you got started. It is an autobiography of a mapmaker named Aoife from a faraway land. An adventure of love,loss,the human spirit,a mythic treasure,and one woman’s courage to do the unexpected. An interesting tale of the human spirit,love,Asian legends, hope and human’s redemptive spirit. If you enjoy Asian legends,mystic treasure,adventure,fantasy,faraway lands,and the magic of legends,then “The Mapmaker’s War” is a title for you to read. An interesting read. Received for an honest review from the publisher. I received this Advance Uncorrected Proofs-Not For Sale softcover version Courtesy of Simon & Shuster Canada and Goodreads. I am ever so grateful for having the opportunity to preview a book so far in advance of its publish date. A fantastical tale filled with beautiful imagery, strong influences of many different cu I received this Advance Uncorrected Proofs-Not For Sale softcover version Courtesy of Simon & Shuster Canada and Goodreads.